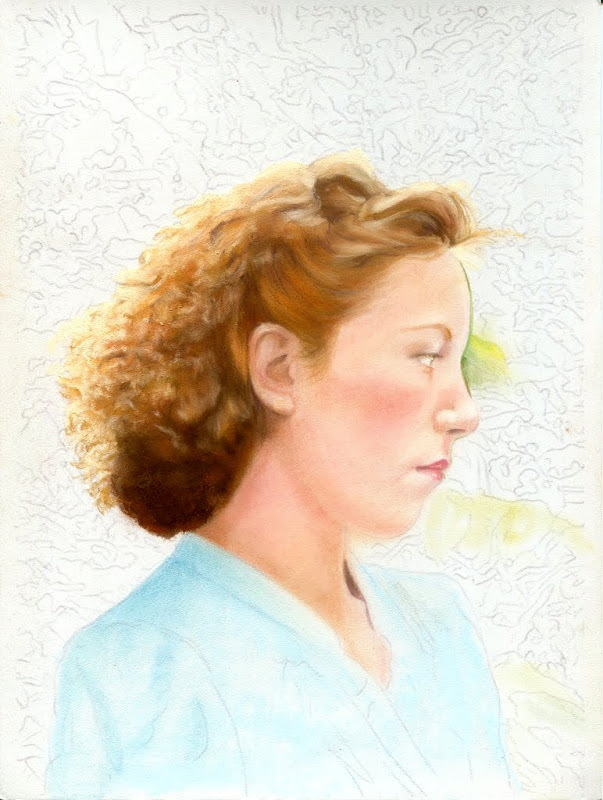 I recently joined the Pastel Society of Southern California (PSSC) because I love pastels and would like to learn how to use them properly. I attended my first meeting in January and was very pleased and excited to find that we have so many pastel artists in the area. This is going to be a great resource for me and I'm looking forward to all the upcoming meetings. The PSSC is having it's second annual member's show at the end of March and I decided to jump right in. 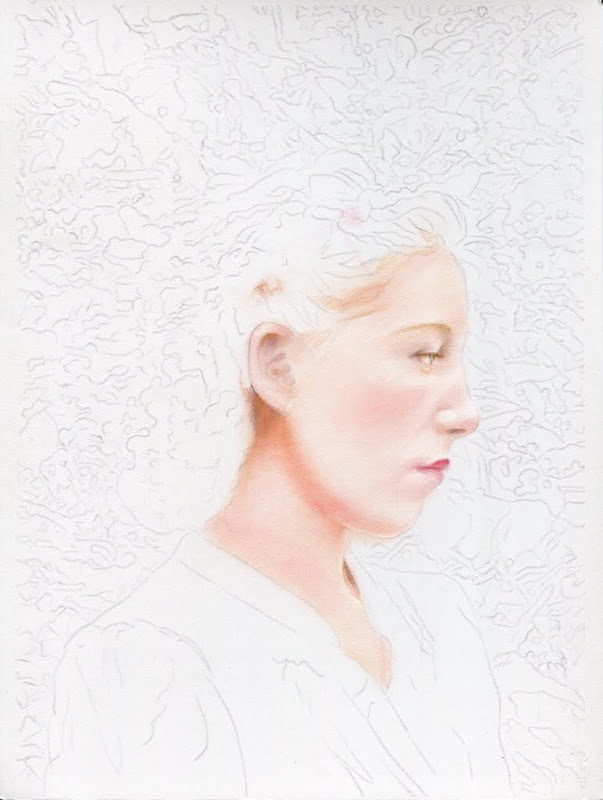 I have a small pastel piece that I started last August. I picked it up again a few weeks ago to try and finish it for the PSSC show. I originally just wanted to test out a new pad of pastelmat paper I had bought. I find that I like this paper very much. It has a smooth velvety finish that holds lots of pastel very nicely. These are shots from the early progress. 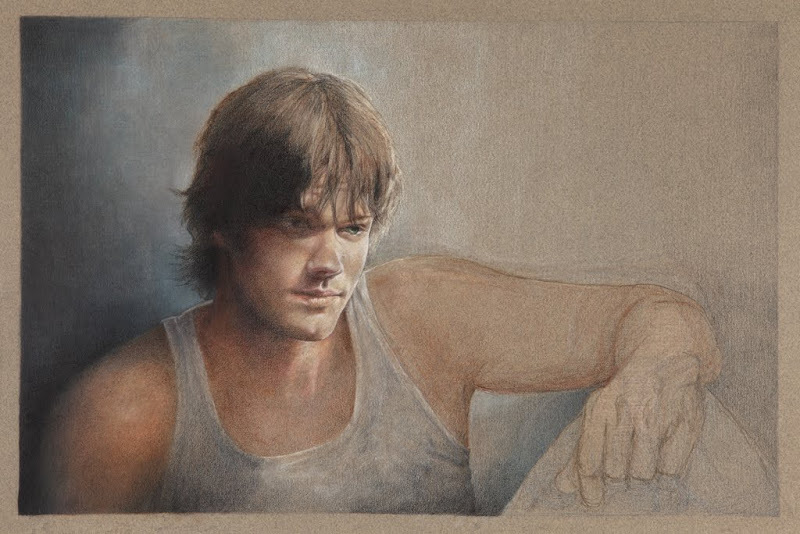 Everything I did at this stage was with pastel pencils, since pencils are what I feel most confident with. It felt more similar to using colored pencils. Yea! I'm done, really this time. It's even signed. I worked on his eye again because it just didn't seem right. The only way that I know it's really right this time is because I can walk away from it and when I come back later to study it with a fresh eye, nothing stikes me as looking wonky. I've been doing that all day. Fixing a lid line, moving an eyebrow just a tad over, moving the corner of the eye out, etc and every time I came back to see it again something else looked wrong. Well this version finally passed the walk-away-and-look-at-it-later test. 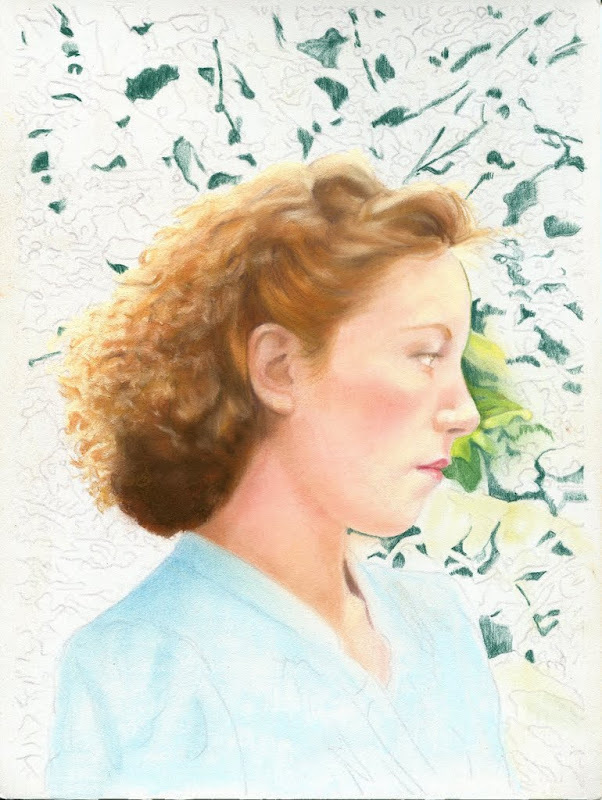 I'm so glad, because I am heartily sick of this portrait now. I want to put it in a drawer and not look at it again for a long time. If I can manage to keep my hands off of this, it's done except for my signature. 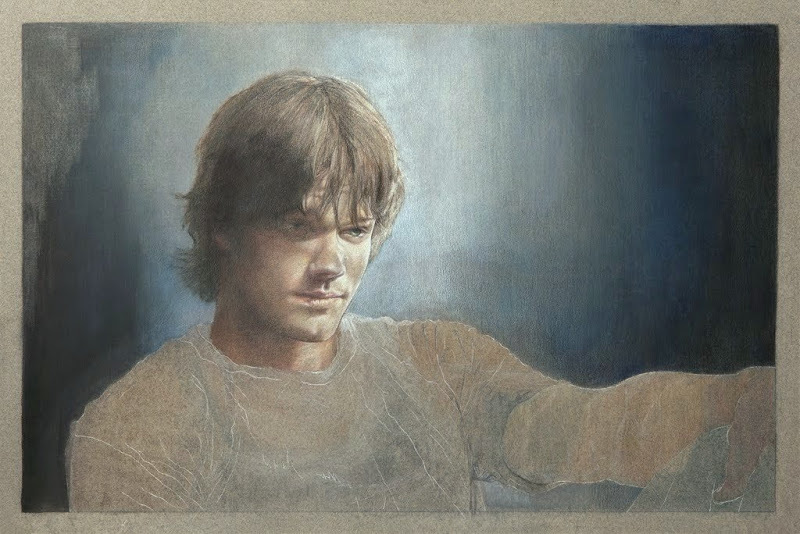 The main difference between the last stage and this is that I defined the shape of the light hitting his shirt, I took the brights a lot lighter and the darks much darker. I also had to redefine the eye in the shadow. I had been thinking about taking this shadow very dark and so not have to worry about the eye hidden there. Unfortunately when I did start darkening this whole area, it looked much too stark. He looked like he had on a dark eye patch and the rest of the shadow areas by contrast looked too light. So I ended up lightening the eye shadow and having to redraw the wishy washy eye. 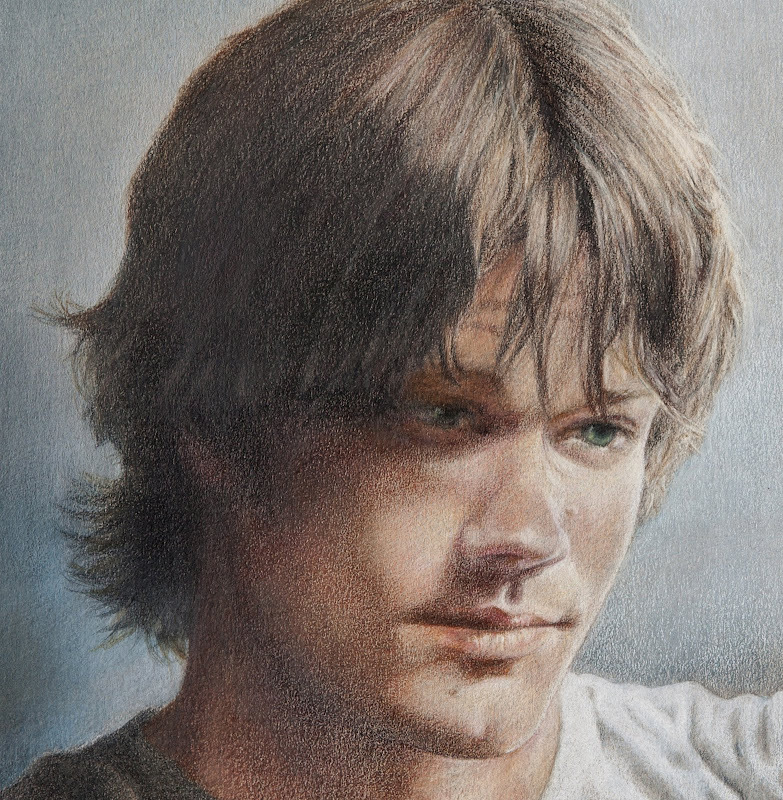 I had been trying to avoid doing this because of having no real reference for that side of his face. So I ended up having to wing it and hoping I'd end up with a realistic looking eye. Who knows, looking at it now, I think I like the previous eye better. Arghhhhhh. Oh well, tomorrow is another day, I'll look at it in the morning. 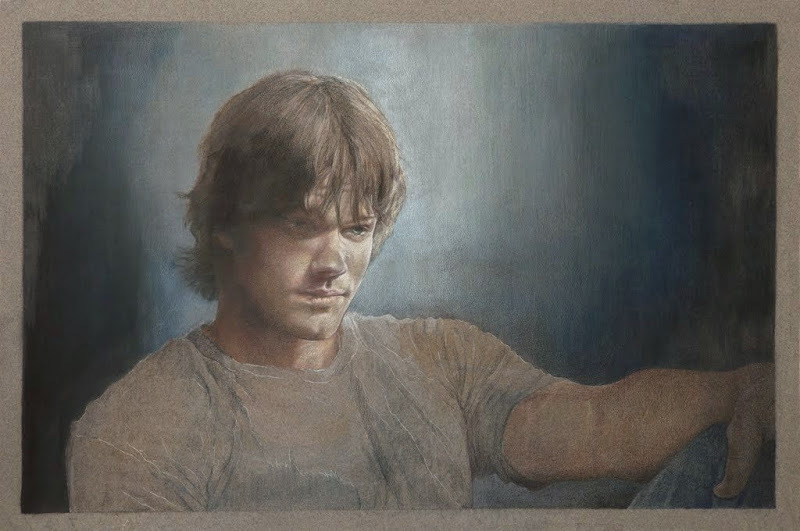 Here's the latest on the Sam portrait. I took the time to take a better picture so the colors are more true to life. I still need to extend and darken the shadow areas and to intensify the highlighted areas, but it shouldn't take me too much longer. I'm beginning to plan how to frame this, because I'm thinking of putting it in a local colored pencil exhibition. I'm very much looking forward to finishing this. 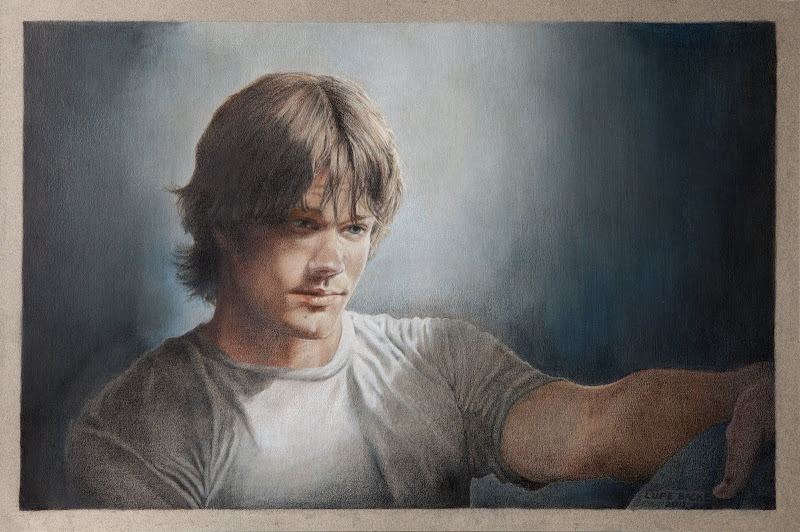 I finally had to face the fact that no matter what I did to try to fix my Sam drawing, I still didn't like it. Even the satisfaction with the last tweaking faded after a few days. I realized that the only way to make it work would be to redraw the body. I think the problem in general was that this original pose just didn't seem natural. The figure's left shoulder was too high and looked contorted and I could never figure out where to position the right shoulder. Also his left shoulder looked too big, but whenever I tried to scale it down, it would throw everything out of whack. 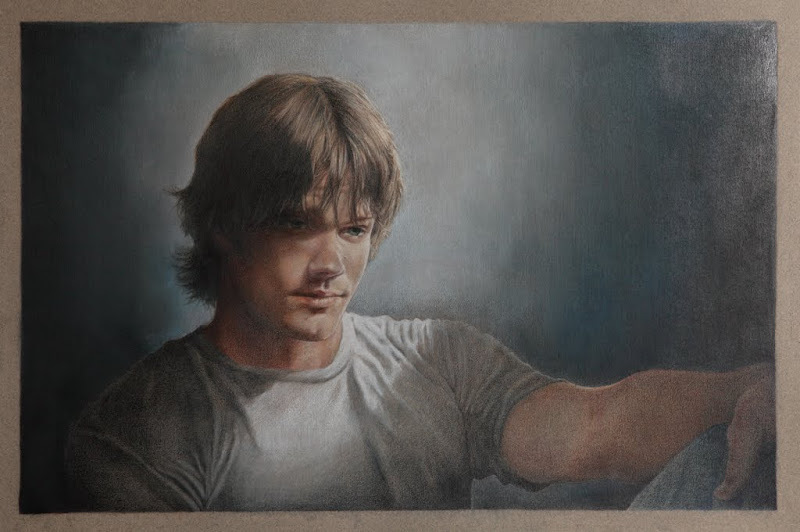 Before getting to my latest version, I tried lowering the shoulder lines, lengthening them out, I made his chest larger, made it smaller, I redrew his arm and hand, I tried obscuring his whole right shoulder in the shadows, but it just never worked. I was really ready to throw everything out the window, but I figured I could give it one more go, so I erased his body and started again. I wasn't sure that the paper would take this, but I figured I had nothing to lose. I searched my reference images for a compatible body pose and I found one that I thought could work. 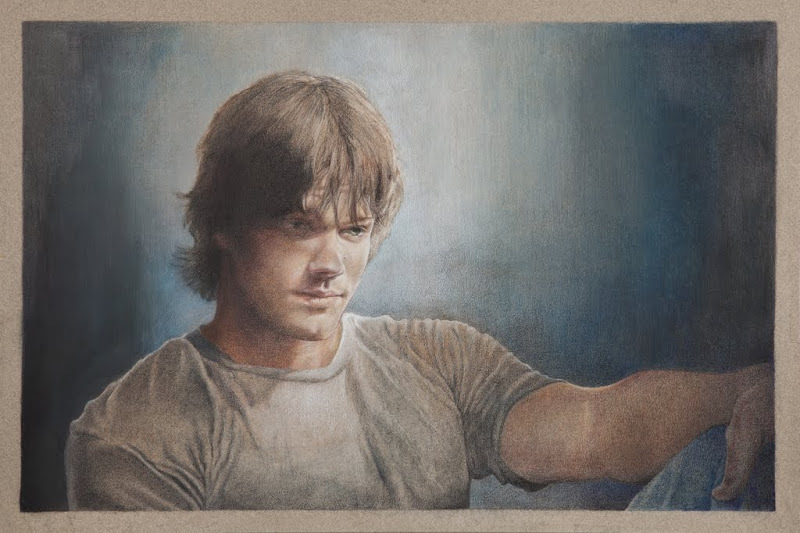 It even had a similar light source, so this is what the new drawing looked like. 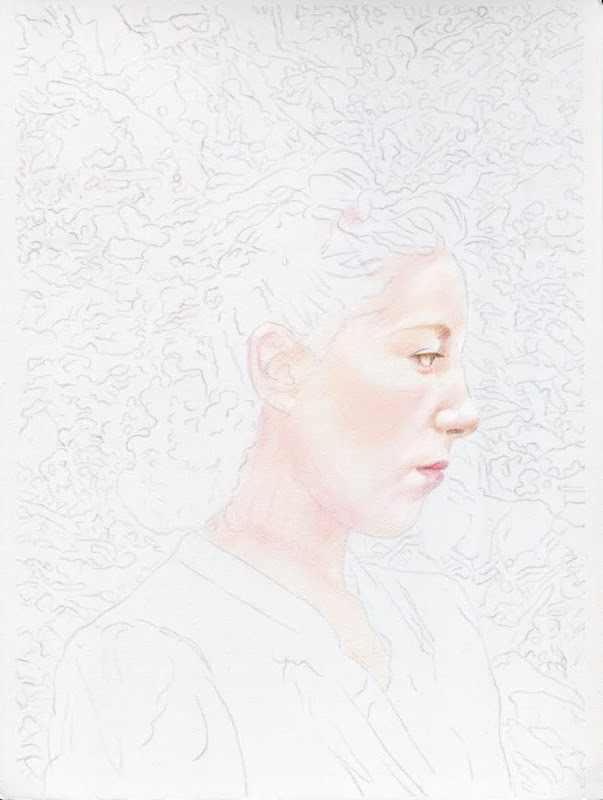 The color is off in the photo, but you can see where the paper was stained by the previous color pencil application. In this photo I have also already done a lot of new background work on the right. The blotchy areas in the backgound are actually shiny spots causing reflections in the picture. All my brushing and layers of color have pretty much killed the tooth of the paper in these areas. If I can get this finished, hopefully spraying on a fixative will help to even up the surface at the end.